All 17 songs on Travis Scott’s latest album Astroworld landed spots on Billboard’s Hot 100 when the album dropped in August, making the rapper one of just five artists ever to have at least 17 songs on the chart simultaneously. Scott’s Astroworld Tour kicks off in November, but he gave fans a sneak-peek of the show on Saturday Night Live last weekend as well as some surprise collaborations with John Mayer, Kevin Parker of Tame Impala, and well-known producer Mike Dean. He started off the night on a high note, performing a medley of two of the most popular songs on his album, “Astrothunder” and “Skeletons,” alongside Mayer and Dean. The musicians were also accompanied on stage by a woman riding a carousel horse amidst dream-like fog, which was meant to resemble the album’s surreal amusement park theme. A similar mood was set later in the night when Scott performed his song “Sicko Mode” upside-down in an arcade console while the camera spun in circles around him. And the fun did not stop there. Scott surprised viewers once again when he appeared in a skit with host Awkwafina in which he played a backup dancer for Mariah Carey named Lil Bang Bang. 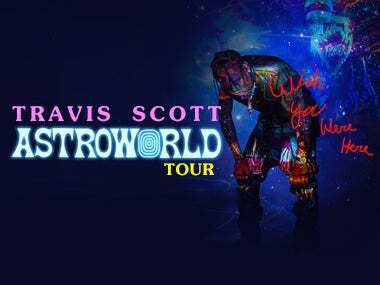 Don't miss Travis Scott when Astroworld Tour comes to Golden 1 Center on December 15!